Explore our Innovative Flexographic Printing Presses & Machines. Our Machines are built to the Highest Quality and come with a ariety of Customisable Features. Flexographic printing technology is widely used for printing on all types of packaging and label material. Our machines are built to the highest quality and come with a variety of customisable features. All machines come with a full warranty. The Comet is a narrow web flexographic label and packaging press designed for labels, special packaging materials, and folding box cartons. 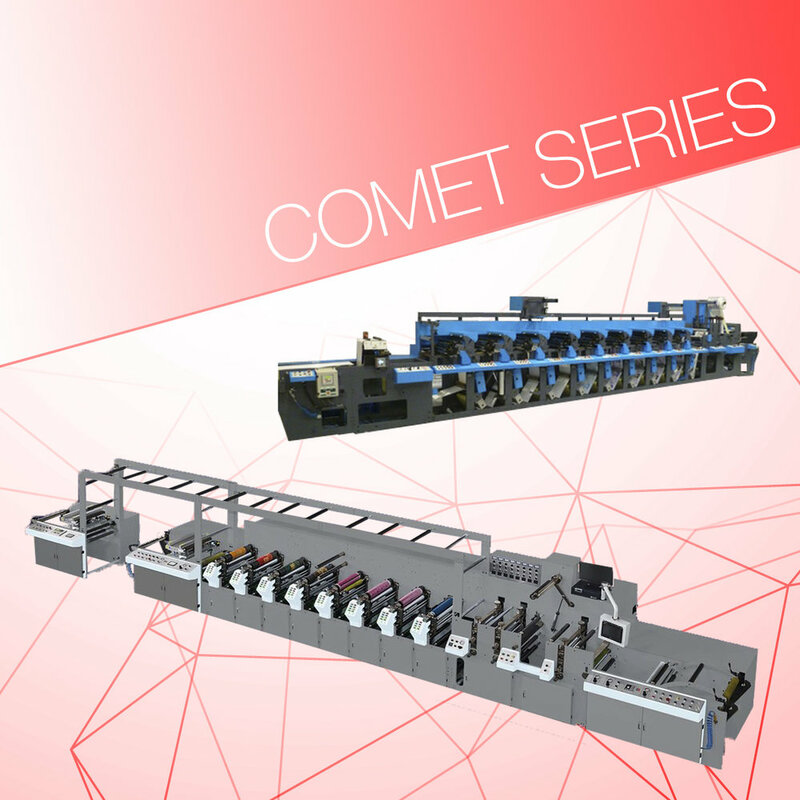 The Comet is equipped with the latest rail system allowing converting modules to be added for multi-converted products. The Comet has very fast make-ready features such as a slide-out Ink Tray cassette. This includes tool-less change-over for the anilox roll, metering roll, and print cylinders. The Comet is available in 4 web widths of 270mm, 340mm, 430mm and 530mm. The Apollo is a label and packaging printing press capable of printing the highest quality labels in up to 10 colors. With a small footprint and easy operational functions, this is an excellent partner for the label printer or a useful addition to other larger presses. The specially designed web-path system reduces the web-path length throughout the press by over 40% compared to conventional inline presses. The tool-less design of the flexo units increases the preparation time of setting up a job, leading to greater efficiency and higher profits. The Apollo is avaliable in 7 web widths of 330mm, 480mm, 530mm, 650mm, 750mm, 850mm and 950mm. The Autoflex series is a unique flexographic press, having been designed through years of historical research. Using tools that clients have required in the past and extrapolating that into the future, we invented a press that allows clients to produce a variety of products that cannot be done on a standard press. From sophisticated label products, to specialized film work with added security features, and a range of folding carton products, the AutoFlex can do it all. The Autoflex is avaliable in 13 web widths of 270mm, 340mm, 430mm, 480mm, 530mm, 610mm, 680mm, 830mm, 1120mm, 1300mm, 1435mm, 1600mm, and 1800mm.